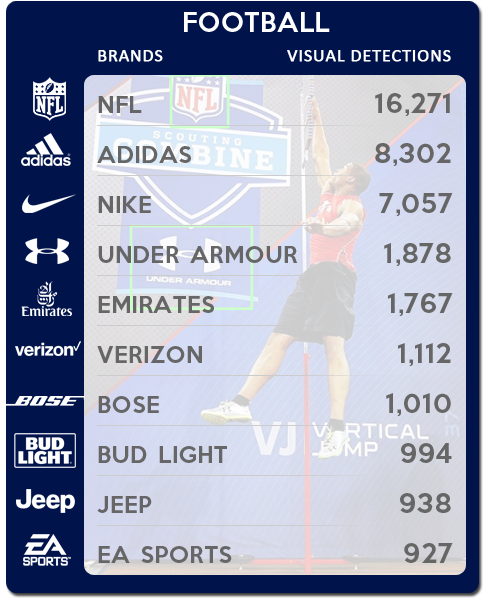 Which brands get the most visual mentions? Some cumulative data. We’ve been at this for a few years now, and although if you are a licensed user you can dig around in our data through either Custom Reports (what we used to call Search) or your own reports, we often get asked why we don’t do more “researchy” industry reports for the community at large. The short answer is we’re a software platform, not a research company, but that doesn’t mean we don’t know how to dig around large amounts of data and feed some snippets to everyone now and again. So all of the numbers below are cumulative since we have been collecting data, though we are always adding data from rights holders and brands over time, so all comparisons are not quite apples to apples. Perhaps the most interesting thing about these numbers is that a very high percentage of our visual detections are not accompanied by a textual mention or a hashtag. We not only detect the brand on images and videos posted online, but we’re also able to give a value to that social exposure. We continue this review with basketball, but Adidas still remains on top. 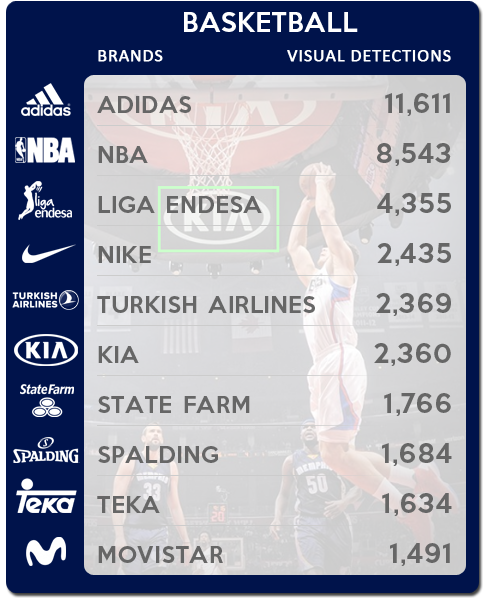 Second position belongs to the NBA brand and the third spot goes to Liga Endesa, the top basketball competition in Spain. In this ranking we can see Turkish Airlines, main sponsor of the Euroleague, or Kia Motors, probably the most important sponsor of the NBA. 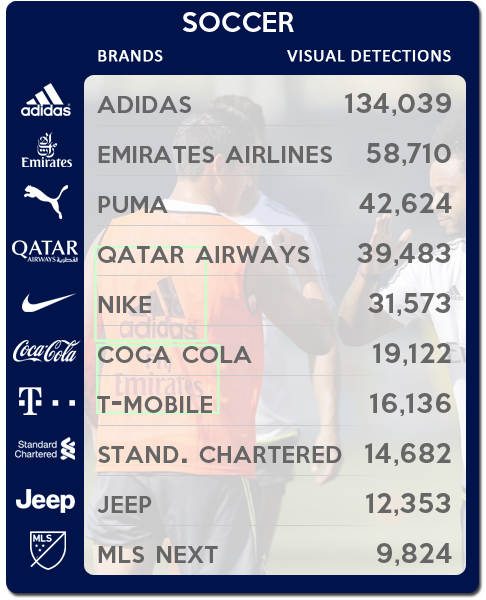 As we said at the beginning of this post, the most important thing about these numbers is that all these visual detections are really hard to track for both brands and right holders. Until now the tracking was done manually and using past information. Our brand detection technology identifies those logos nearly in real time, and then we aggregate the information about engagement and valuation so our customers can export reports any time they want, saving a lot of time and work. 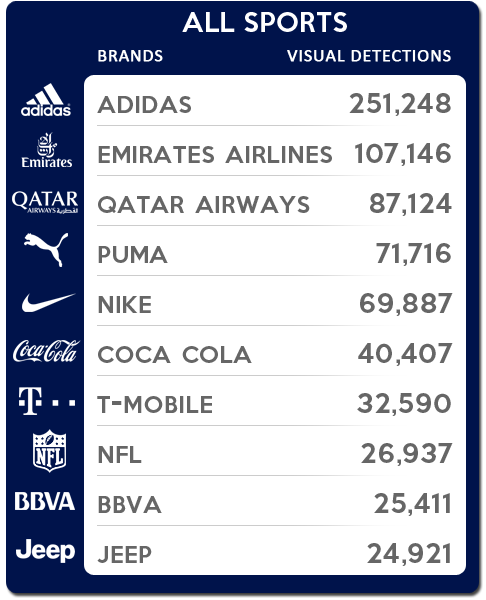 Do you want to know more about our brand detection technology and our instant reports? Just whistle!